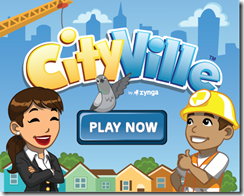 Zynga recently launched its latest game title CityVille. It is described as “Monopoly meets Main Street” – it’s a city building and management game. So far the game is growing even faster than FrontierVille, as reported in TechCrunch. Build the city of your dreams.